The practical and attractive solution for those annoying “hot spots”, cool your home the natural way! 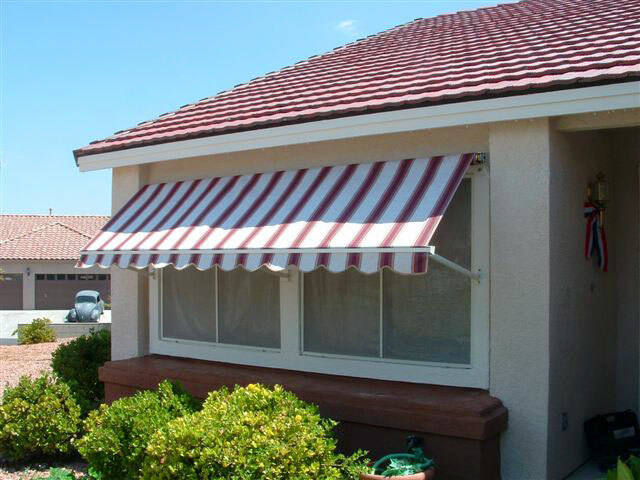 Vertical arm window awnings can be completely retracted, fully extended or set anywhere in between and may be operated from the interior or exterior with manual, motorized, remote or automated controls. You control how much sunlight enters your home. Window awnings can lower a room’s temperature by as much as 65% while greatly reducing incoming glare and light. Awning fabric Marine grade solution-dyed woven acrylic by Sunbrella. Over 150 colors to choose from. Guaranteed not to fade, rot, or mildew. Hardware is constructed with high strength aluminum extrusions and protected with a durable powder-coated baked on finish. Wide range of motion allows you to keep your block the sun’s UV, heat and glare and provides daytime privacy. Sizes: Widths from 1′ to 20′ and projections up to 5’. All made-to-measure to the quarter-inch. Accents’s retractable awnings are available with numerous options that enhance operation and performance or provide additional protection. Timers, Remote Control or Fully Automated Sensors you can choose to operate your awning or allow the fully automated sensors to do it for you. 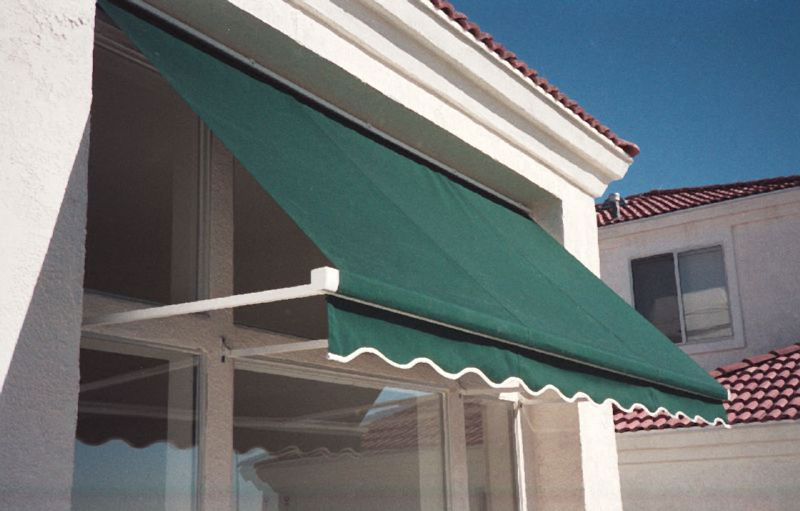 Protective hood a decorative powder coated aluminum cover adds to the aesthetic appeal of the awning and provides protection of the fabric when in the retracted position. Crank Manual Override “C.M.O.” allows retraction of motorized awnings during power failures. 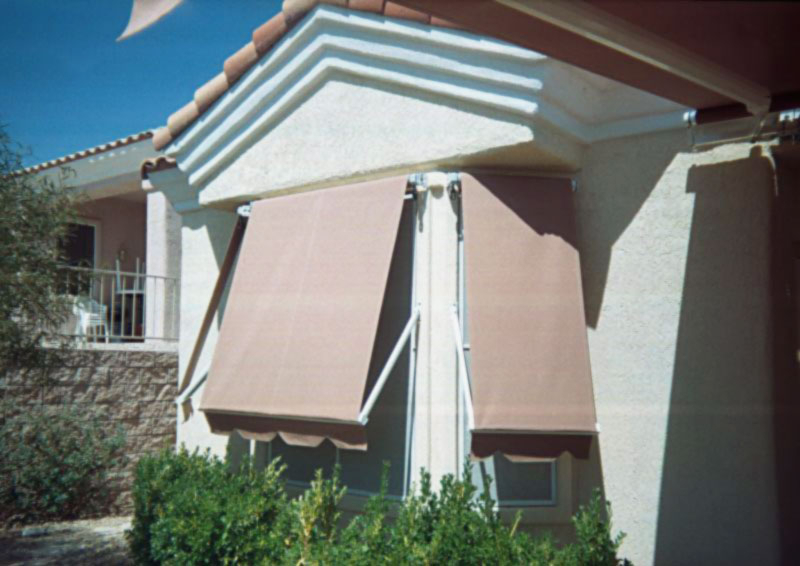 *We do not recommend or install these items due to high wind conditions in the Las Vegas area.